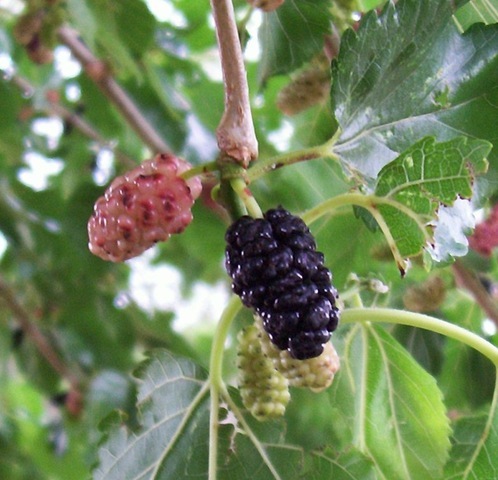 For nearly a decade, I’ve had fruitless mulberry trees in my yard. In Plainview, living there from 2000 – 2007, we had one very large in the front yard and one equally large in the back. They provided massive amounts of shade, which was great for the front yard, not so great for the back since the previous owners of the house had installed an above ground pool that spent the hottest hours of the day in that shade. It made for pretty cold swimming. It was almost comforting to see that the house we decided to rent in Lubbock also had one of these trees in the back yard. Well, turns out, to my surprise, it is not a fruitless mulberry. Similar though it is to those Plainview trees, we are now tracking mulberry juice into the house as it has shed quite a few berries. I believe you are mistaken…if you recall the monkey chased the weasel around the mulberry bush…not the mulberry tree. We had one of those in Dumas. Not only did it make a BIG mess in the yard, it also attracted some pretty vile insects! @Trae: We do seem to have a large bush made up of saplings growing at the push of the tree so we were planning on drawing straws to see who would play the monkey and who would play the weasel. @N’Ida: I’m glad we have hardwood floors because I know those kids will be tracking the stuff inside. Ah, yes, those dratted berries. Remember the grape tree (that we finally discovered was a dead pear tree completely covered with grapevines), strategically placed so our driveway was covered with grapes and everyone that came to our house could enjoy the fun of tracking the pulp into the house. It made exellent firewood. Lori just scoffed at your comment, jon. I was convinced.